Today I am so excited to be posting my first thoughts about Fall! Since I live in Southern California, I have to remind myself our fall doesn’t arrive until October. Believe it or not, our hottest month is usually September, so it still feels like were are in the middle of summer. 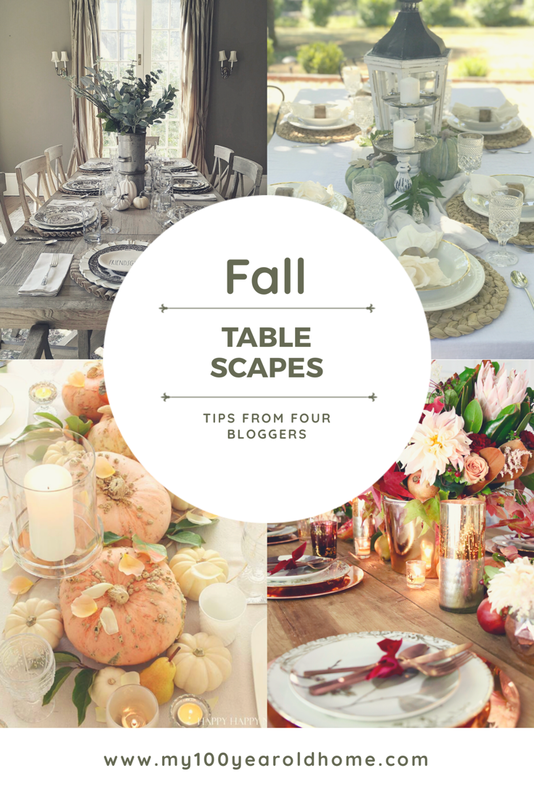 But I love fall, and I love tablescapes, so sharing fall table ideas is something I love to do. I am sharing a few of my fall tables from last year. The first table was for a dinner party I hosted for friends, which we appropriately called “Friendsgiving”. It was a really wonderful evening and you can’t imagine how hard we laughed all night long! One of my favorite things to do when I set a table is to layer plates with charges, placemats and anything else that works. On this table, I used burlap placemats, off-white charges, dinner plates and my Rae Dunn Friendsgiving plates. I went with a very neutral color scheme which I absolutely love. I added white pumpkins and filled my vintage cheese molds with fresh eucalyptus and greens. 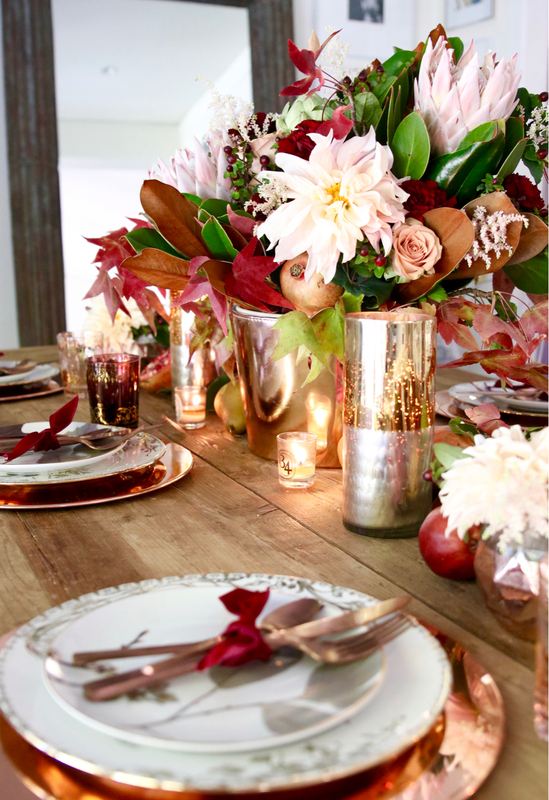 My friend Ashley from Modern Glam set a gorgeous blush and rose gold Thanksgiving table. For this table, Ashley used a mix of fall colors and blush flowers to go with the rose gold accents. She used lots of fresh fruit by adding pomegranates, pears, and artichokes. Ashley added candles, twinkle lights, and themed plates. But the real accent on the table is the rose gold chargers. They are stunning. Isn’t this table just incredible? 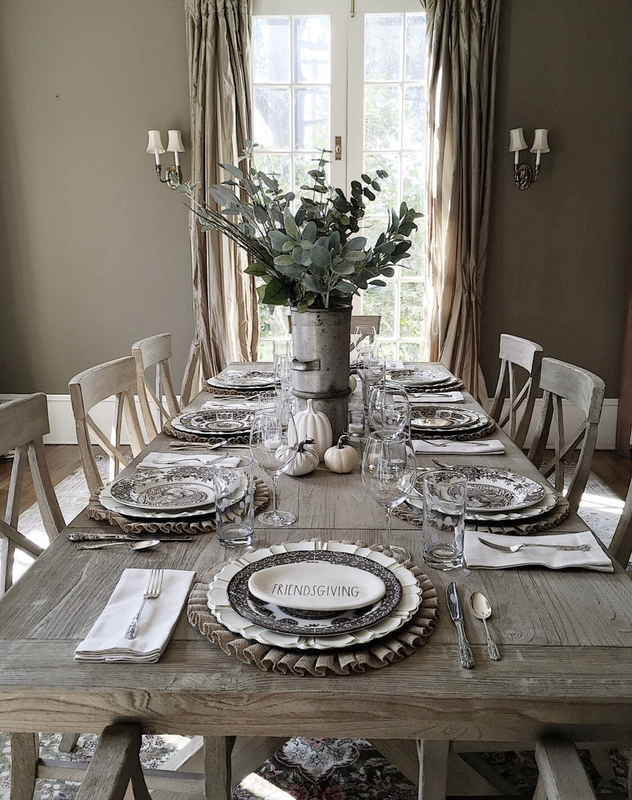 Head on over to Ashley’s blog to see more of her fall table setting. 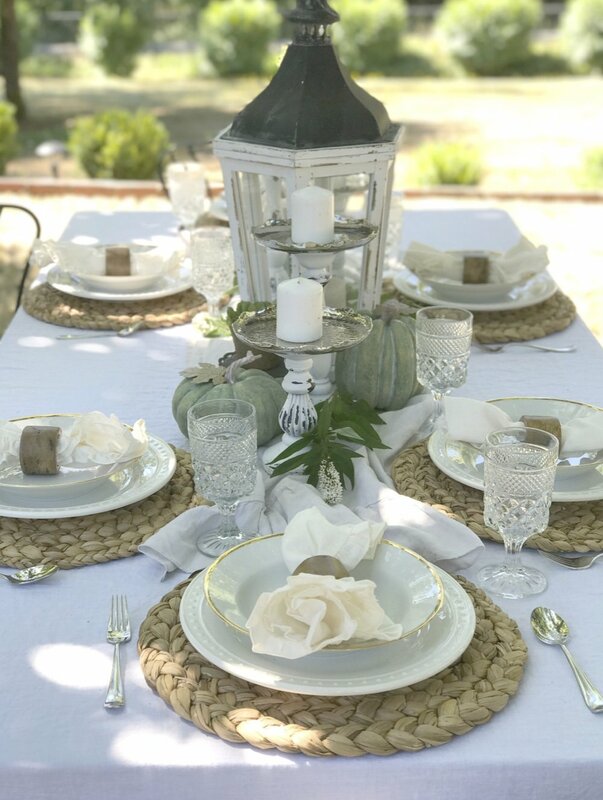 Rhonda at Hallstrom Home set an outdoor fall table using soft colors and pops of greenery. She mixed gold and silver and managed different heights in her centerpieces. 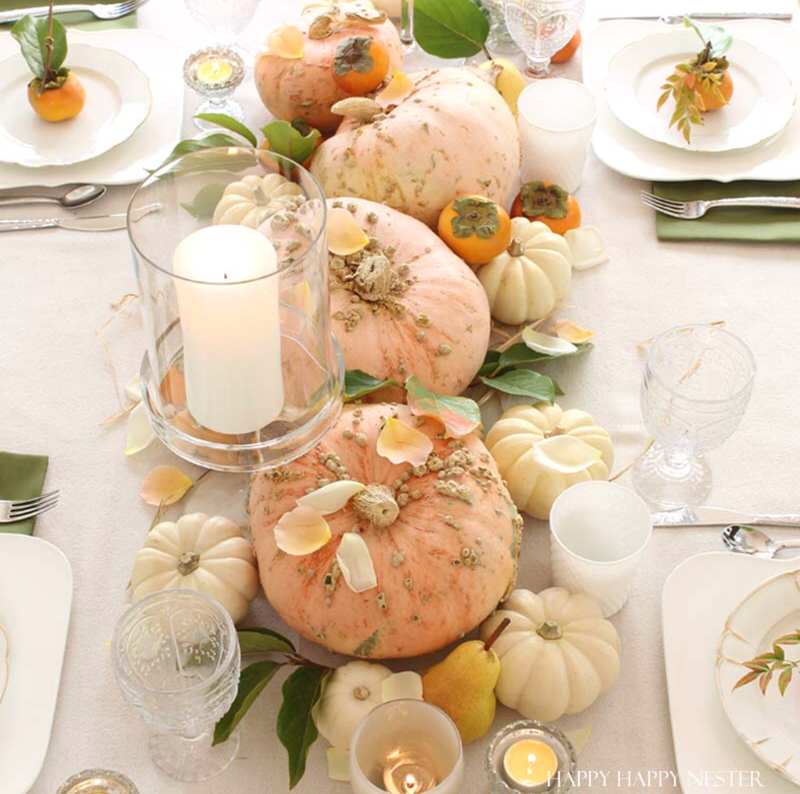 I love the green pumpkins and how she used the outdoor lanterns in the centerpiece. This is a fabulous table. Head on over to Rhonda’s blog to see more of her gorgeous fall tablescapes. Janice from Happy Happy Nester created this tablescape based on her inspiration from this awesome pink pumpkin. Then she shopped her house and started adding decor. Of course, a few trips to Trader Joes were a must but she perfectly created what she calls “a balance of color, space, and texture”. Janice is the artist and her table is the canvas. And she created a masterpiece. Head to Janice’s blog to see lots of beautiful photos of her amazing fall tablescape. One of the benefits of living in Southern California is that our outside dining area is likely to be a big part of our Fall decor. As I mentioned, two of the best weather months for outdoor dining are September and October. When I set the outdoor dining area for the Fall, I knew I wanted to do something really rustic. Since the only fresh plants I can seem to keep alive are succulents, I decided to go with a succulent theme table setting! I absolutely love how this came out. I used my large tin vintage platters, aged terra cotta pots, IKEA placemats and my favorite napkins from Kitch Studios. 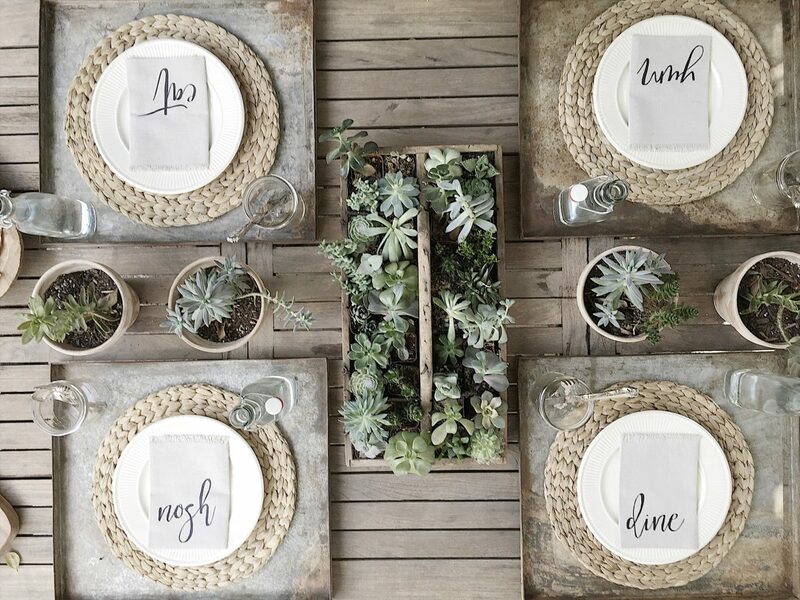 The rustic look feels very fall, even when the weather is really warm in Southern California. I hope today’s blog post has inspired you to bring out some of your fall decor. I am so inspired with all of the fall decorating ideas I see everywhere and I can’t wait to add a fall theme to our home this week! What a wonderful fall table post! Leslie your table is so stunning and elegant. After reading all these posts, I’m so pumped to celebrate fall in our home! My goodness! 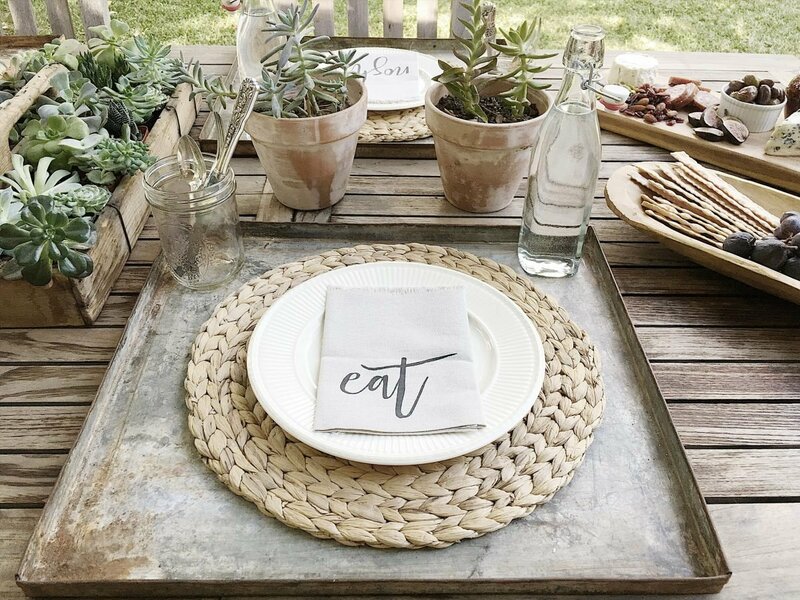 Such eye candy for a tablescape lover like myself. You all set such beautiful creative and welcoming tables. Thanks for the inspiration ??? ?